Yesterday morning I started with a rather protein-packed breakfast. And a carb-packed breakfast. And a fat-packed breakfast. OK OK!! It was a delicious-packed breakfast but not on the top 10 list of the most healthy. Yep! 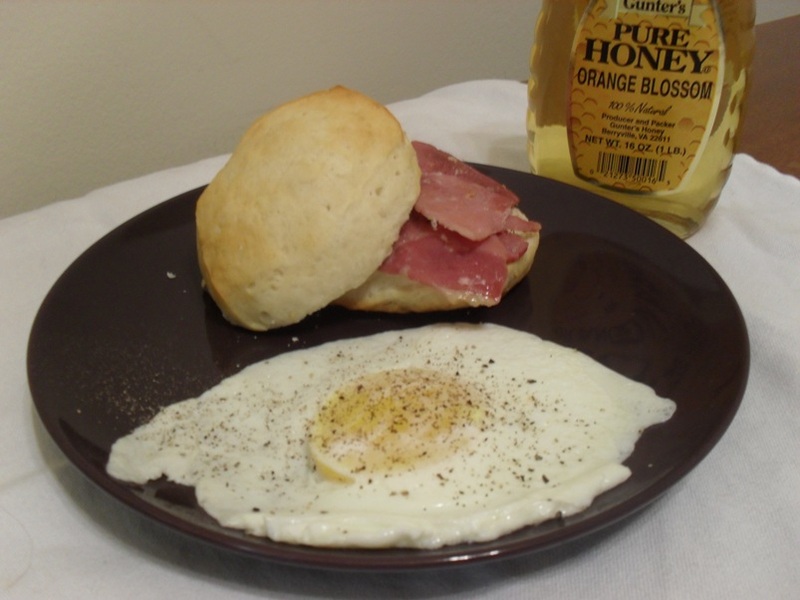 In the picture below you will see real country ham on that HUGE biscuit. Served with a little Virginia honey and a delicious fried egg. I cannot lie, it tasted SO fantabulous! I’m not really a pork fan, but lately I’ve craved ham biscuits. Go figure. And thanks to Cindy who hooked me up to some really good ham! But then there was the Middle East Mosabahat al Khodar for later in the day. It was done by noon, but after that larger than normal breakfast, who could eat at noon? This dish calls for lots of veggies and two pounds of beef chunks, but I cut back on the meat and only used one-half pound. 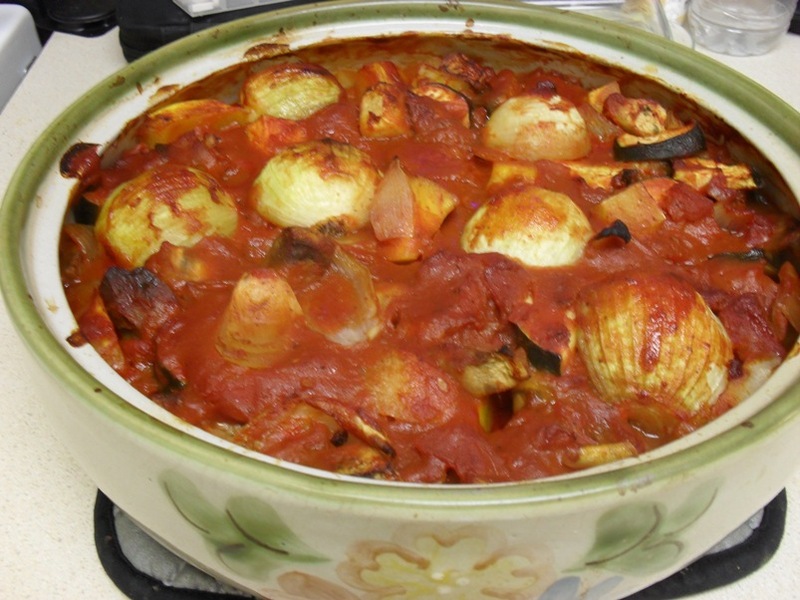 After searing the meat I added onions, tomatoes, winter squash, white potatoes, zucchini, and egg plant. There was garlic and extra onions (one of my favs!) Oh my was it delicious! And you can tell from my picture below I will have lots of it available to freeze for lunches! There was also a small Lebanese salad with homemade yogurt and mint dressing, with a little olive oil drizzled over the top. 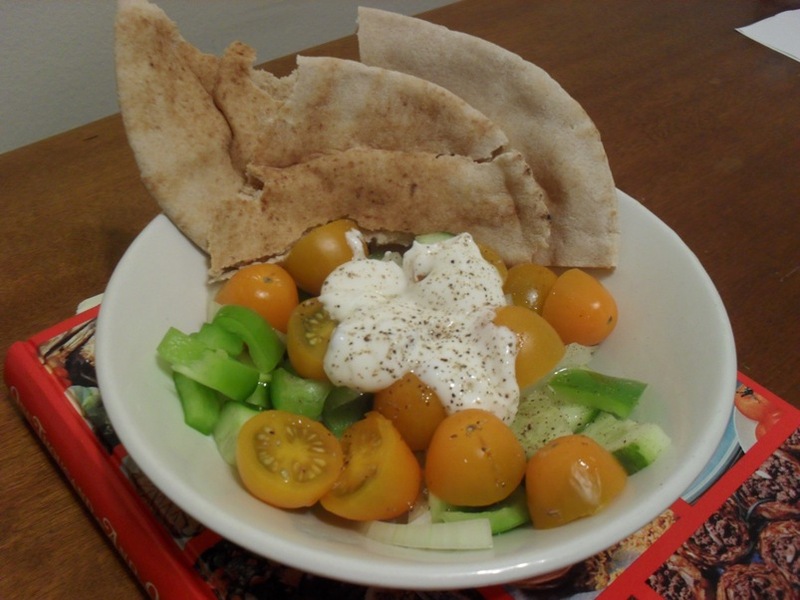 And pita bread, of course, to sop up all the dressing and juices at the bottom of the bowl. Yes, my dinner in beautiful Lebanon this afternoon 🙂 was wonderful !